Welcome back and happy Thursday, friends! Over the course of July and August, as summer heated up and the daylilies waned, I stepped away from the world for a bit. Priorities shifted and rotated. It felt better to be more "in" than "out." I purged stuff. I collected other stuff. It’s a vicious, beautiful, maddening game of garden chess. I used my quiet, distracted energy to purge my daylily collection by about half. It's become clear to me that I love a lot of daylilies (gasp) and I love the photos I have taken of the near 500 that grow here and I love the color combinations that appear when they are all in bloom. I love all of the memories behind every one of them in my collection. Some because of who hybridized it, some because of where I was when I first saw it, some because the form, color and size make my heart skip a beat. But I cant keep them all. I have to let some of those memories go so that I can enjoy the new ones that are moving in. So September saw massive Facebook flash sales and auctions, and 32 boxes of free daylilies sent to new collectors all over the country! 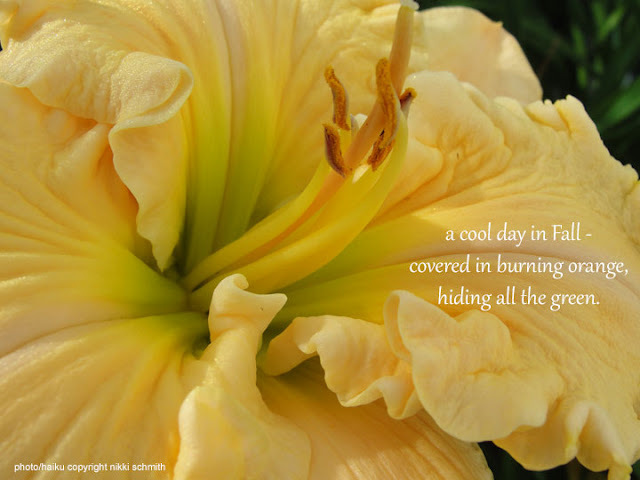 It was fun to get to know Facebook connections that were new to daylilies and wanted to learn more about hybrid daylilies. That was much-needed goodwill therapy. October and November have been overflowing with elementary school events, computer work and home administrivia - as well as preparing to serve as President of the American Hemerocallis Society starting January 1. Things are simmering now on all fronts and we are all looking forward to the holidays. I'm headed off to the reengergized Buffalo Area Daylily Society this weekend to present my new program for 2016 - "The Collective Experience." This is my theme this year, and will be my guidepost for my first year as AHS president. Im excited to see how the program is received. Check out the Calendar of Events for more scoop on the programs in my library. If you are looking to get yourself a little something this holiday season, and you want to add some daylilies to your collection that might not be widely grown where you are, consider these choices. They were SPECTACULAR this year in my own garden, and while I dont personally have any of these cultivars to sell, a quick Google search of the name and the word daylily might yeild you some possibilities. If you have any of these to sell other readers, please note that in the comments below! IDA MAE NORRIS - (below, left) I could have eaten dinner off these blooms - they were so big and flat with an abundance of substance. And what an icy pink! RED SAPPHIRE - (below, right) A masculine, yet fancy conversation piece. Maybe the most photogenic in the garden this year. Fragrant, reblooming, too. I was so pleased to take home Best In Show at the 2015 Central Illinois Daylily Show with this cultivar! And from the Herrington's, HAT'S OFF TO SUE - (below, left) Bloomed four days straight with 20 or more blooms open at one time. And it rebloomed and was picture perfect every time. If you can find it, grab it at whatever cost. I sold out this year, even sold tiny single fans at the buyer's request just to get a piece of it in their gardens. Its a stunner. CHICKEN COOP MADONNA - What can I say about the below flower from Gene Tanner out of Browns Ferry Gardens? I picked this one up on name alone at the 2014 National Convention auction and it has taken off. Its first year in the garden and it performed like a champ! This is the best first year plant ever. Blooms that you just want to lick! Agree? WAYNE AND CORALS LOVE - (from the Nethertons and Peace On Earth Gardens in Georgia) This is another I bought as a small DF in Asheville last year at National (after an intense bidding war that Mark Franklin graciously let me win) and its now 12-plus fans and rebloomed twice. Its a spark of a different color and has good motion for a little thing. I think Ill let my little clump grow through the 2016 season and I should be able to line it out and sell a good amount next fall. Many have asked for it already, and I just couldn't bear to share it yet. It was the fastest multiplier in my collection. It doubled its original planting size three times in one year. Amazing. I also plan to take it to a show next year to see how it stacks up in the mini section. So many daylilies this season put on mouth-watering, delicious displays. It was a strange, strange summer - filled with weather and wonder from start to finish. Two large plant sales allowed me to cull out whole clumps of daylilies that have overstayed their welcome in my collection. It was time for some of my "old" favorites to grace someone else's garden. I was hired to do three residential plantings this summer and lifted over 50 10-fan-plus clumps out of my garden and planted straight into theirs. It was fun to plop ready-made daylily awesomeness into someone else's yard. I cant wait to hear their squeals next year for more. When I was first starting out with daylilies, a previous national tour garden owner allowed me to come to her garden and choose whole clumps to jumpstart my budding collection. She was moving far away and not taking the daylilies, so I had my pick of her near 1000 cultivars in 2002. What a blessing that was! This summer, it felt great to let others come and collect their gardens from my own yard! There are so many stories to tell from Summer 2015. I'm glad Fall is here so that my brain can settle and I can get some of them out here for you to enjoy. BEAUTIFUL! I don't know how you do it. I am not a gardener, but with most beautiful things, I am a hoarder. It would be hard to let things go, but it is true, you can't keep it all.